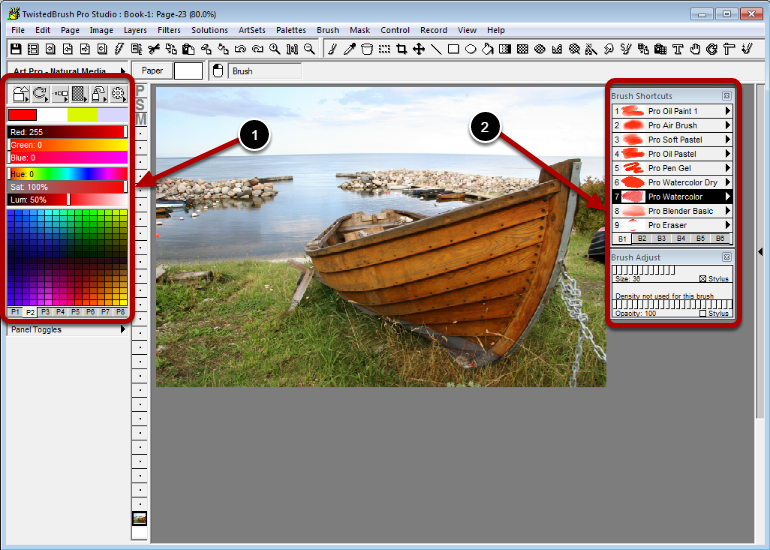 In TwistedBrush Pro Studio the Paint Control panels by default are docked on the left side of the application space, however, these panels can be undocked to allow you to work in a way the works best for your style. The terms docking/undocking and floating are used interchangeably. Right click on the paint control panel you want to undock. 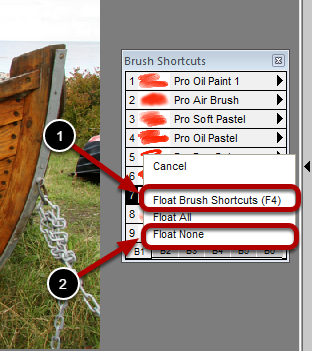 From the popup menu select the Float Brush Shortcuts item. Of course each of the paint control panels will have different text for the menu. Notice the paint control panel area is automatically adjusted when some of the panels are undocked. When undocked the paint control panels can be freely placed anywhere. When all paint control panels are undocked the Paint Control panel area is reduced. Here all five of the paint control panels undocked. 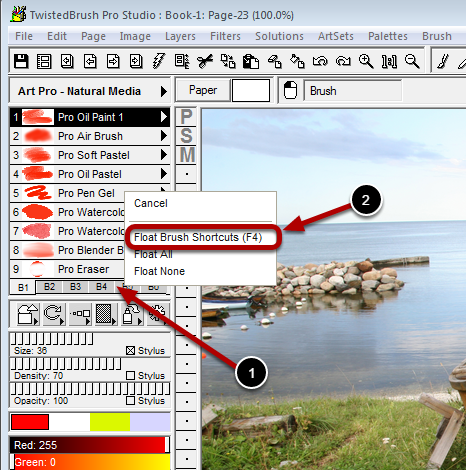 To dock a paint control panel right click and toggle the Float Brush Shortcuts menu item. 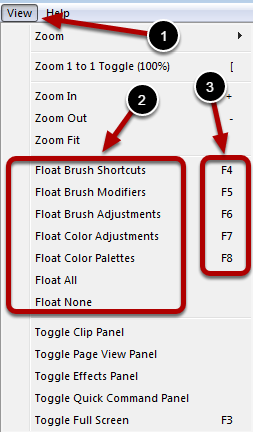 To dock all the currently undocked paint control panels use the Float None menu option. 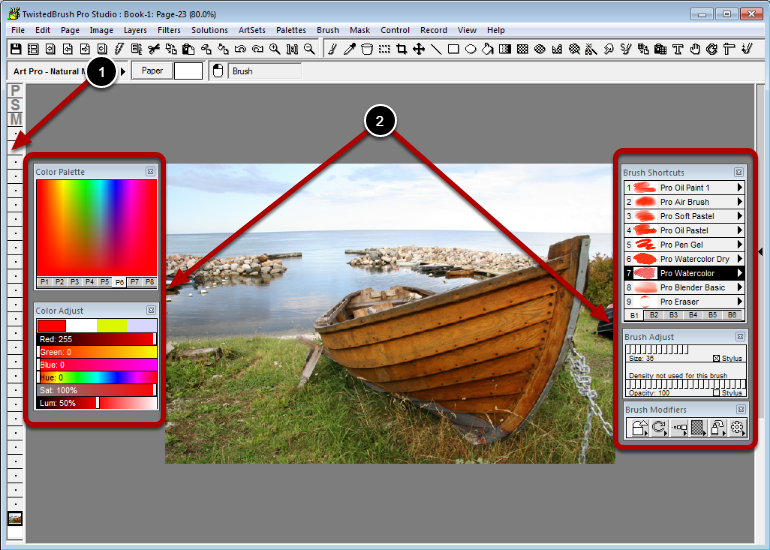 The View menu offers additional ways to dock and undock the paint control panels. Each paint control panel can be managed here separately or all together. Notice shortcut keys are also available to quickly dock and undock the panels.